any of the mononuclear nonphagocytic leukocytes found in the blood, lymph, and lymphoid tissues; they comprise the body's immunologically competent cells and their precursors. They are divided on the basis of ontogeny and function into two classes, B and T lymphocytes, responsible for humoral and cellular immunity, respectively. Most are small lymphocytes 7–10 μm in diameter with a round or slightly indented heterochromatic nucleus that almost fills the entire cell and a thin rim of basophilic cytoplasm that contains few granules. When activated by contact with antigen, small lymphocytes begin macromolecular synthesis, the cytoplasm enlarges until the cells are 10–30 μm in diameter, and the nucleus becomes less completely heterochromatic; they are then referred to as large lymphocytes or lymphoblasts. These cells then proliferate and differentiate into B and T memory cells and into the various effector cell types, B cells into plasma cells and T cells into helper, cytotoxic, and suppressor cells. See subentries here and under cell. adj., adj lymphocyt´ic. Origin of B- and T-lymphocytes responsible for cellular and humoral immunity. 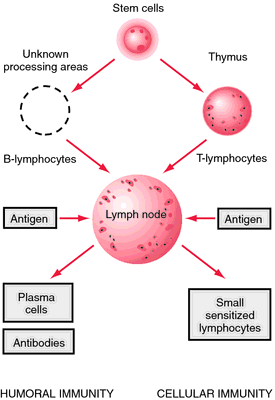 In response to antigens, B- and T-lymphocytes are sensitized by lymphoid tissue. lymphocyte activation stimulation of lymphocytes by specific antigen or nonspecific mitogens resulting in synthesis of RNA, protein, and DNA and production of lymphokines; it is followed by proliferation and differentiation of various effector and memory cells. Activation is accompanied by morphologic changes known as lymphocyte transformation, in which small, resting lymphocytes are transformed into large, active lymphocytes (lymphoblasts); the formation of lymphoblasts is referred to as blastogenesis. amplifier T l's a T lymphocyte of the CD8 cell type that modifies a developing immune response by releasing nonspecific signals to which other T lymphocytes (either effector or suppressor cells) respond. B l's “bursa-equivalent” lymphocytes; a type that develop from stem cells in hematopoietic tissue, including the blood islands of the fetal yolk sac, the fetal liver and spleen, and the bone marrow. The B in the name refers to the bursa of fabricius, an organ in birds where B cell differentiation occurs; however, no analogous organ has been found in mammals. Called also B cells. B lymphocytes are involved in humoral immunity, the secretion of antibodies. A mature B lymphocyte can be activated by the binding of an antigen to cell surface receptors. This induces proliferation of the cell, resulting in a clone of cells specific for that antigen. These cells can then differentiate and begin to secrete immunoglobulin (Ig) molecules; this step involves interaction with helper T lymphocytes. All the cells of a clone secrete Ig with identical antigen binding sites. Antibody-secreting cells can have the morphology of plasma cells, large lymphocytes, or lymphoblasts. CD4 T l's (CD4+ T l's) CD4 cells. CD8 T l's (CD8+ T l's) CD8 cells. cytotoxic T l's differentiated T lymphocytes, marked by CD4 and CD8 antigens, able to recognize and lyse target cells bearing specific antigens recognized by their antigen receptors. The cytotoxic activity requires firm binding of the lymphocyte to the target cell to produce holes in its plasma membrane with loss of its cellular contents and osmotic lysis. These lymphocytes are important in graft rejection and killing of tumor cells and virus-infected host cells. Called also killer or killer T cells. lymphocyte proliferation test a functional test of the ability of lymphocytes to respond to mitogens, specific antigens, or allogenic cells. The test with allogenic cells, called a mixed lymphocyte culture (MLC), is commonly performed for transplantation tissue typing; all three types of stimulants are used in investigation of immunodeficiency. Commonly used mitogens are phytohemagglutinin (PHA), concanavalin A (ConA), and pokeweed mitogen (PWM); commonly used antigens are PPD (tuberculin), Candida antigen, and streptokinase-streptodornase. Rieder's lymphocyte a myeloblast with a nucleus and several wide, deep indentations suggesting lobulation, seen in Rieder's cell leukemia and sometimes chronic lymphocytic leukemia. Called also Rieder's cell. T l's “thymus-dependent” lymphocytes; a type that originates from a stem cell in hematopoietic tissue and undergoes differentiation in the thymus when triggered by thymopoietin. Called also T cells. When activated by antigens such as the CD4 antigen or the CD8 antigen, T lymphocytes differentiate into the various types of regulatory and effector T cells (see CD4 cells and CD8 cells). The CD8 cells called cytotoxic T cells or killer T cells are responsible for cell-mediated cytotoxicity, which is the killing of cells bearing specific antigens, the mechanism involved in cell-mediated immunity, delayed hypersensitivity, and killing of tumor cells and transplant tissue cells. A subpopulation, the LAK cells, is involved in the production of lymphokines, substances released into the blood that cause activation or inhibition of macrophages, destroy target cells, or are chemotactic for the various types of leukocytes. The CD4 cells called helper T cells help B lymphocytes recognize certain antigens. Amplifier T lymphocytes are CD8 cells that enhance the activity of cytotoxic T cells. Suppressor T cells are CD8 cells that suppress antibody synthesis by their action on helper cells and B lymphocytes. A white blood cell formed in bone marrow and distributed throughout the body in lymphatic tissue (for example, lymph nodes, spleen, thymus, tonsils, Peyer patches), where it undergoes proliferation. In normal adults, lymphocytes make up 22-28% of the total number of leukocytes in the circulating blood. 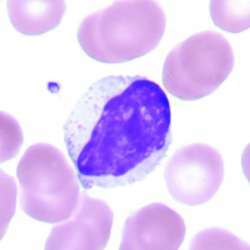 Lymphocytes generally are small (7-8 mcm), although larger forms (10-20 mcm) occur frequently. With Wright or similar stain, the nucleus is colored a deep purple-blue and is composed of dense aggregates of chromatin within a sharply defined nuclear membrane; the nucleus usually is round but may be slightly indented, and is eccentrically situated within a relatively small amount of light-blue cytoplasm that ordinarily contains no granules; especially in larger forms, the cytoplasm may be fairly abundant and include several fine granules of bright red-violet; unlike granules of the myeloid series of cells, those in lymphocytes do not yield a positive oxidase or perioxidase reaction. Lymphocytes are divided into two principal groups, T and B cells, based on their function and on characteristics of their surface molecules. Null cells, which include natural killer cells, represent a small percentage of the lymphocyte population. B lymphocytes B cells, bursa-dependent lymphocytes; the precursors of antibody-producing cells (plasma cells) and the cells primarily responsible for humoral immunity. cytotoxic T lymphocytes (CTL) differentiated T lymphocytes that can recognize and lyse target cells bearing specific antigens recognized by their antigen receptors; they are important in graft rejection and killing of tumor cells and virus-infected host cells. Rieder's lymphocyte a myeloblast sometimes seen in acute leukemia and chronic lymphocytic leukemia, having a nucleus with several wide and deep indentations suggesting lobulation. T lymphocytes T cells, thymus-dependent lymphocytes; those that pass through or are influenced by the thymus before migrating to tissues; they are responsible for cell-mediated immunity and delayed hypersensitivity. Any of the nearly colorless cells found in the blood, lymph, and lymphoid tissues, constituting approximately 25 percent of white blood cells in humans and including B cells, which function in humoral immunity, and T cells, which function in cellular immunity. a family of mononuclear, nonphagocytic white blood cells that circulate in blood, lymph, and peripheral lymphatic tissues. Lymphocytes are categorized as B and T lymphocytes and natural killer cells and are responsible for humoral and cellular immunity and tumor surveillance. Also called lymph cell, lymphocyst. See also lymphokine. lymphocytic, adj. A white blood cell formed in lymphatic tissue throughout the body (e.g., lymph nodes, spleen, thymus, tonsils, Peyer patches) from precursor cells originating in bone marrow and in normal adults making up approximately 22-28% of the total number of leukocytes in the circulating blood. Lymphocytes are generally small (7-8 mcm), but larger forms are common (10-20 mcm); with Wright (or a similar) stain, the nucleus is deeply colored (purple-blue), and is composed of dense aggregates of chromatin within a sharply defined nuclear membrane; the nucleus is usually round, but may be slightly indented, and is eccentrically situated within a relatively small amount of light blue cytoplasm that ordinarily contains no granules; especially in larger forms, the cytoplasm may be fairly abundant and may include several fine, bright red-violet granules; in contrast to granules of the myeloid series of cells, those in lymphocytes do not yield a positive oxidase or peroxidase reaction. Lymphocytes are divided into two principal groups, T cells and B cells, based on their surface molecules as well as their function. Natural killer cells, which are large granular lymphocytes, represent a small percentage of the lymphocyte population. a type of LEUCOCYTE (white blood cell) of the AGRANULOCYTE group which is formed in the bone marrow from which they differentiate into either B CELLS or T-CELLS. The typical size is about the same as a red blood cell (about 8 μm in diameter). Lymphocytes are not themselves motile, but are capable of destroying foreign ANTIGENS in the IMMUNE RESPONSE, collecting in the spleen and lymph nodes which may become swollen in a severe attack. The two types of lymphocyte react in different ways, T-cells destroying the antigen themselves (cell-mediated immunity) while B-cells produce ANTIBODIES. A type of white blood cell that is important in the formation of antibodies. Doctors can monitor the health of AIDS patients by measuring the number or proportion of certain types of lymphocytes in the patient's blood. A white blood cell formed in bone marrow and distributed throughout the body in lymphatic tissue (e.g., lymph nodes, spleen, thymus, tonsils, Peyer patches), where it undergoes proliferation. n a form of white blood cell originating in lymphoid tissues; possesses a single spherical nucleus and a nongranular cytoplasm. It constitutes 25% of the white blood cells. Some, along with plasma cells and histiocytes, are found in clinically normal gingivae. Their numbers within the gingival connective tissue are increased in periodontal disease. With progress of gingival inflammation to the underlying bone, they are also found within the marrow spaces of the supporting bone. n short-lived, non thymus-dependent lymphocytes that synthesize antibodies for insertion into their own cytoplasmic membranes. They are the precursor of the plasma cells. n.pl a subset of white blood cells that, when present, are located near the odontoblastic layer. An increase in lymphocyte count is indicative of inflammation. killer cells, because they secrete immunologically essential chemical compounds and assist B cells in destroying foreign protein. T cells also appear to play a significant role in the body's resistance to the proliferation of cancer cells. a mononuclear, nongranular leukocyte having a deeply staining nucleus containing dense chromatin and a sparse, pale-blue-staining cytoplasm. It participates in immunity. one that has reacted on exposure to antigen or to a mitogen. thymus-independent lymphocytes, which develop from stem cells in hematopoietic tissue, including the blood islands of the fetal yolk sac, the fetal liver and spleen, and the bone marrow. The B in B lymphocyte refers to the bursa of Fabricius, an organ in birds where B cell differentiation occurs. No analogous organ has been found in mammals, though an equivalent is assumed to exist—probably bone marrow. B lymphocytes are involved in humoral immunity, i.e. the production of antibodies. A small, mature B lymphocyte can be activated by the binding of an antigen to specific cell-surface receptors. This induces proliferation of the cell, resulting in an expanded clone of cells specific for that antigen. These cells can then differentiate and begin to secrete immunoglobulin (Ig) molecules. Antibody production for most antigens involves interaction with helper T lymphocytes. All of the cells of a single clone secrete Ig that binds specifically to the antigen that stimulated the production of antibody. Mature antibody-secreting cells are plasma cells. Following blastogenesis some of the cells produced by division revert to small lymphocytes and remain as a longlived clone of 'memory' cells. increased DNA synthesis followed by cell division and differentiation of lymphocytes in response to antigens or mitogens; an in vitro test of lymphocyte function. histocompatibility antigens found on lymphocytes, macrophages, epidermal cells and sperm, capable of stimulating division in allogeneic lymphocytes. Called also lymphocyte-activating antigen. a subset of T lymphocytes that is itself comprised of Th1 and Th2 cells that cooperate with and regulate B lymphocytes in the antibody response and with themselves and other effector T lymphocytes. cellular components of the cutaneous immune system. cellular components of the mucosal immune system. a progenitor B cell derived from bone marrow stem cells. small lymphocytes in the G0 stage of the cell cycle, prior to activation. unstimulated B and T lymphocytes. lymphocytes produced from pluripotential bone marrow stem cells which migrate during late embryogenesis to the thymus. Enormous numbers of cells are produced in the thymus, most of which are destroyed there. Less than 10% of cells which are non-self reactive leave the thymus to populate the T lymphocyte areas of the secondary lymphoid tissues (lymph nodes, spleen, Peyer's patches, etc.). At least four subsets of T lymphocytes are defined by cell surface markers and more especially by function. Three of the subsets are regulatory cells called T helper (Th) 1 and 2, and T suppressor (Ts) lymphocytes. The other subset is an effector cell called cytotoxic T (Tc) lymphocytes or CTLs. Following antigen binding to antigen-specific T cell receptor (TCR) molecules, T lymphocytes, like B lymphocytes, undergo blastogenesis, in which they enlarge and divide. Some daughter cells revert to form an expanded clone of memory T lymphocytes. For both regulatory and effector functions, T lymphocytes produce a number of substances generally referred to as lymphokines. Lymphokines, unlike antibody, do not bind specifically with antigen, but rather they direct cell functions. injection of lymphocytes from a potential graft recipient into the skin of a potential donor can be a test of histocompatibility, primarily in humans at the LD loci. Noncompatibility is marked by an inflammatory skin reaction. an obsolete term for a lymphokine that causes transformation and clonal expansion of nonsensitized lymphocytes. T lymphocyte preparations from surgically removed cancer tissue that may be activated in vitro and returned to the host as a basis for specific anticancer therapy. Q. What is the best treatment for Acute Lymphocytic Leukemia? What is the best treatment for Acute Lymphocytic Leukemia? Can you please give me the hospital names and the location where the treatment could be done?